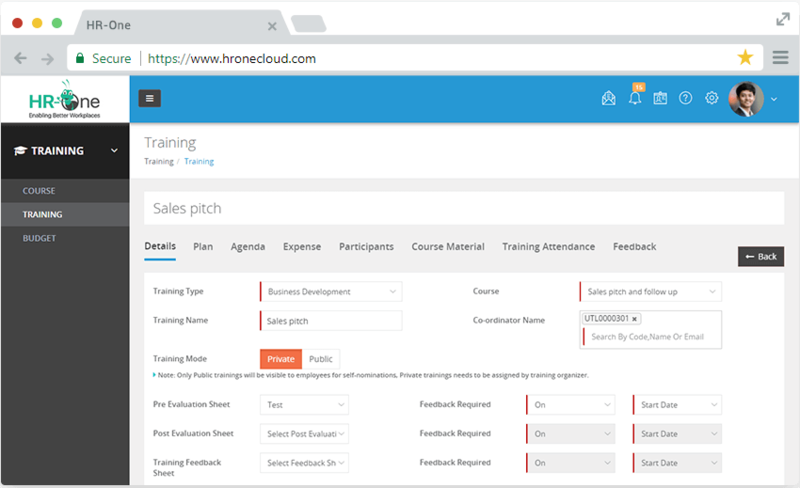 Plan your training schedule, manage invitations & attendance and record training feedback with ease. Helps you plan your training schedule, manage invitations and attendance, set training plans and reminders with ease. Create multiple courses and set trainings for each course. 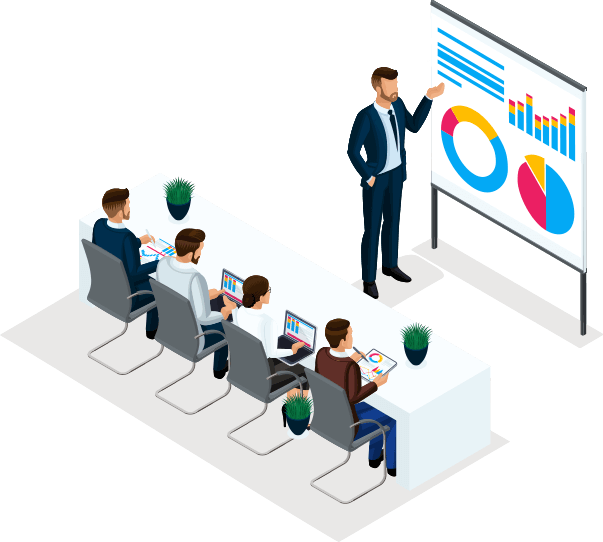 Users can view all the planned trainings and the associated course material at a glance, from pictures, charts, graphs, presentations, invoices, and much more. Set training schedule and course and define per day agenda of training. Get approval on training calendar, set the agenda and invite attendees with ease. With this module, easily schedule trainings that employees need to attend and assign the training to employees or divisions. Easily mark attendance of participants with this training management software. This helps you to monitor performance of a specific training session, and ensure your people are reaping maximum benefits out of the training session. Easy to maintain a pool for curriculum and training syllabus that your employees can take time to time. Users can view all the planned trainings and the associated course material at a glance. You can keep adding new curriculum to the pool and assign them to the respective team members. Simplify and accelerate the entire process of inviting and adding participants to the desired training sessions. Inform your attendees about the essential details like session description, date, time and the trainer's name with HR-One. 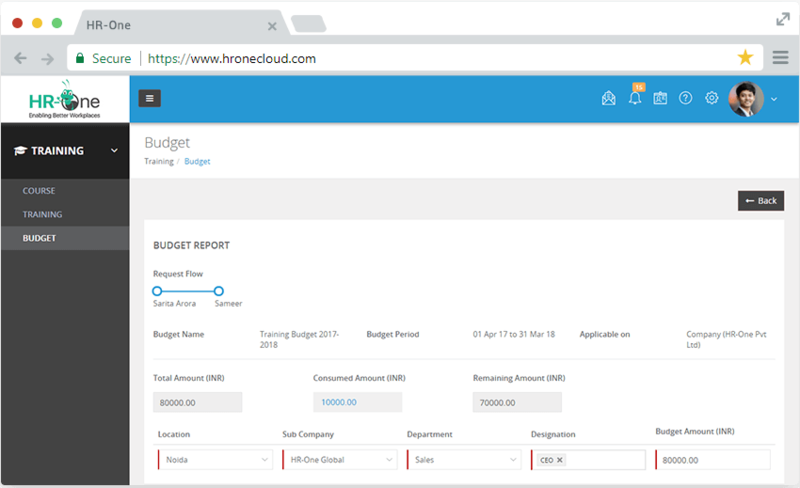 Keep a tight control of your training budget with HR-One HRMS. Plan new trainings on a specific budget, monitor the budget of ongoing training. With this module, easily define and approve budgets for a financial year and manage costs for each training session. Monitor strict control over the assigned training budget and evaluate if it exceeds the said limit. Closely examine position-related costs in line with your training budget and manage costs for each training session. Extract meaningful insights about the training sessions in a tabular or graphical form with ease. Know deeply about the essential details like session description, date, time and the trainer's name through HR-One. Lets you check the effectiveness of pre and post training programs with ease. Helps you provide valuable feedback on whether business goals and workforce objectives are being served. There are ready templates for pre-training evaluation, post training evaluation, feedback and effectiveness sheets. This helps you to record and maintain collective participant feedback about the said training. Easy to extract reports and gauge the success of a particular training session. Derive meaningful insights from HR-One HRMS and know deeply about the session description, date time, trainer's name, budget allocated and success of the session through HR-One. Now it’s easy to set training schedule and course and define per day agenda of training. You can monitor the performance of a specific session and can view all the planned trainings and the associated course material at a glance. 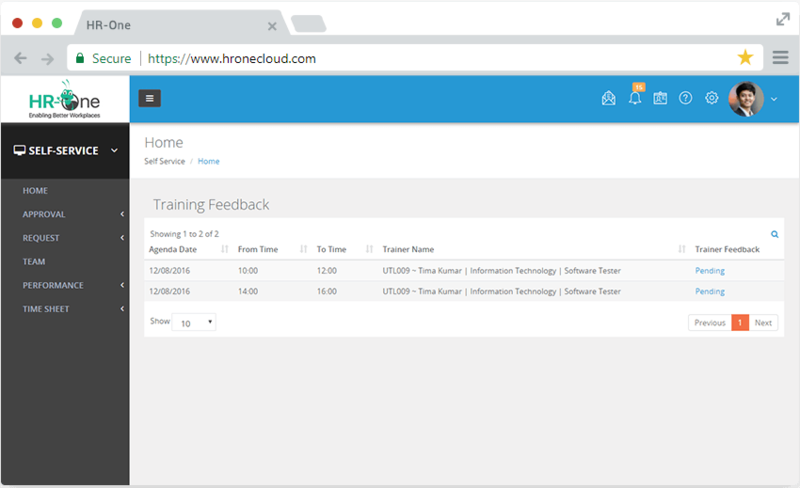 With this training management system, you can inform all your attendees about the essential details of session description, date, time and the trainer's name. Keeping a tight control on your budget, the training management software gives you the flexibility to plan new training on a specific budget and monitor the budget of an ongoing training.